The logout link protects the sender reputation, because: 43 percent of the answering email recipients classify irrelevant newsletters as spam if they find no option for unsubscribing. 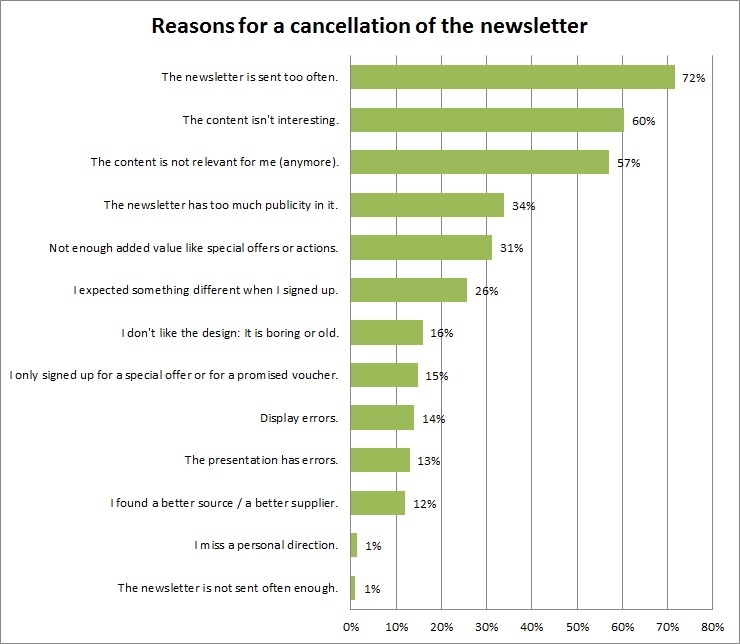 Most common unsubscribing reasons: A high frequency of sending and uninteresting or irrelevant content. This is the result of a survey of Connox, one of the leading online shops for designer furniture and home accessories, among the recipients of his own emails. If there is no unsubscribe link, the problem is fast solved: 47 percent of the people we asked, delete the emails without opening them. 43 percent classify them as spam. Those who would like to bind its newsletter recipients by omitting or hiding of the unsubscribe links, should rethink this again. "Newsletters are often marked as spam, this hurts the reputation of the sender", explains Isabell Waldmann, E-Mail marketing responsible at Connox, "the providers remember if mailings are deleted immediately or classified as spam. If the case occurs often, the risk of them ending up as spam increases. The deliverability falls." Only seven per cent of respondents ignore unwanted e-mail messages in their mailbox. More than seven out of ten respondents said they’d unsubscribe from newsletters, if they appears too often. Approximately six out of ten justify their cancellation with no longer relevant or irrelevant content. Every third feels disturbed by too much advertising or finds no value in offers or promotions in newsletters. The least users feel annoyed by low sending frequencies or an impersonal address: Only one percent takes this as a reason for a cancellation of the newsletter. Interesting: 15 percent of the email recipients have signed up only for a specific offer or the promised voucher and unsubscribe after receiving it. Unsubscribing confirmations are expressly wanted by more than 80 percent of the people we asked. Most of the people (75 percent) don’t want to be informed about social media or other profiles after they signed up. About four out of ten respondents would answer a subsequent question about the reasons for the cancellation. Here, however, it is important to be cautious: Of the 58 percent who would not answer this question, 35 percent find it even disturbing. 1,023 newsletter recipients participated in this survey. Connox is one of the leading online providers in the field of Interior Design. The shop has a huge assortment of awarded design objects, design classics and other pretty things for homes in the online shop connox.de - includin more than 12,000 selected products from the premium segment. The Hanover-based company runs the shop with the in-house "EC suite", which was especially developed for online shopping from the subsidiary Quillo GmbH. Find graphics with the survey results in here . For more information about the company and our products, please surf through the press area .